In Greece 2013, the Greece of Capitalism, banks and Memorandums, the Greeks have to trample and push each other for a bag of food. 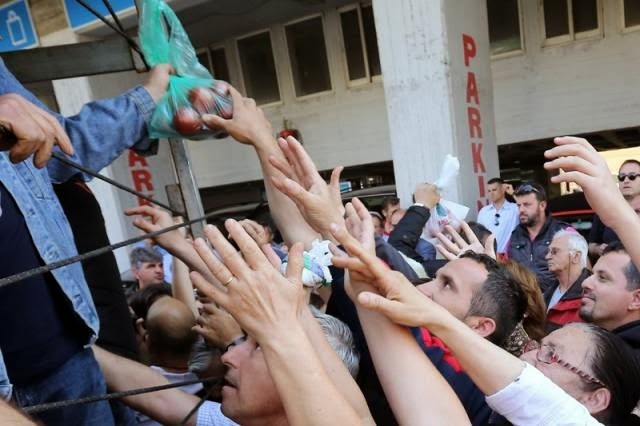 This time the "culprit" was the social market of Kallithea, were hundreds of people pushed aside their dignity and struggled to get one of the 150 "magic tickets" that would guarantee them 2 bags of food. And of course, immigrants are welcome to these taxpayer-funded distributions. The next video is from a group of independent producers that handed out food in an open market. The shocking images enraged even them, and they threatened multiple times that they would stop the handout if order doesn't prevail. 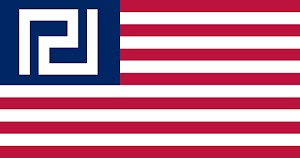 But independent and autonomous groups such as this one inherently can't establish order. Their intentions are pure, and we do hail them, but those practices are working against their own goals, making the Greeks acting like beggars. Good intentions alone are no good. If those practices continue,as time passes and the crisis deepens, we will see people trampled to death. The reactions from the government and the Media are trivial. The vision that anarchists and Left socialists have, that the People can spontaneously and without a coherent structure resist the onslaught of the anti-worker regime, fails in reality and while most of them use those embarrassing images to criticize the government, they never offer an alternative. Because they seek to capitalize from these sad moments. But the alternative exists, and this alternative bugs the hell out of our "benevolent and humanist" Zionist occupiers. 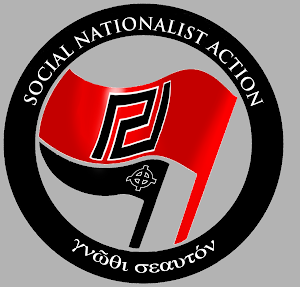 The Hellenic Social Nationalists do what they do not to capitalize from the poverty of the Hellenic working class, not because we want to say "Don't mind the new laws the parliament is voting, we will feed you" but because we BELIEVE that Social Solidarity is a sacred duty that we must all serve for the benefit of our racial brothers and sisters. To give them support and courage to combat the rotting establishment! Our alternative is the Social Solidarity program. Our distributions are characterized by Order, Dignity and Efficiency, funded by both individual donations, producer donations and the (now cancelled) government subsidy so that the money of the People returns to the People. To not only help the Greeks, but also to give them a helping hand that matters. Big portions, for many families, with priority and double portions given to the weakest social groups, handed out in events organized by disciplined comrades, ensure that we are making a difference. And of course, no foreigner is allowed. Greece is for the Greeks! The Media, in both a national and international level, characterize our efforts as "soup kitchens of hate". The government and the Left always denounce the distributions, or try to prevent them by laws or by force. 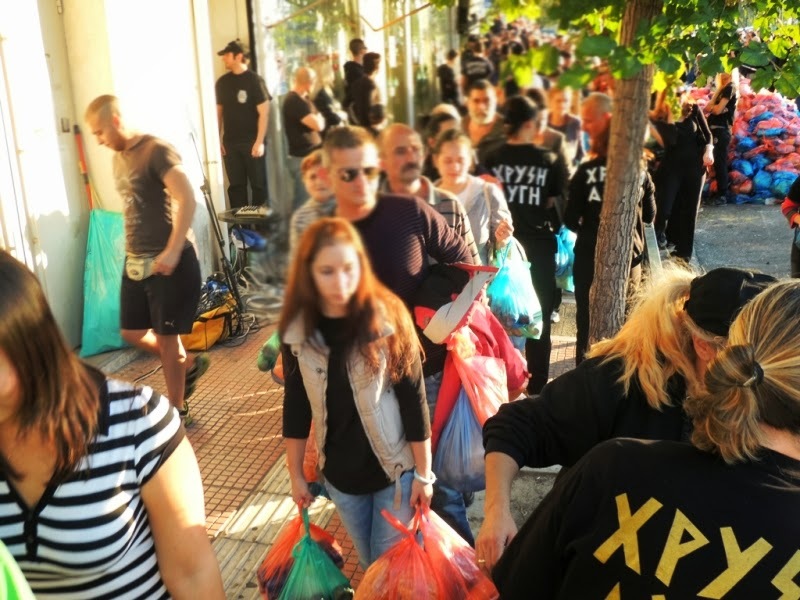 The contrast between Golden Dawn's food distributions and the distributions by other institutes or groups is so big that it leaves no room for further comment. But I must urge every Greek producer to stop and think: He has nothing to prove by standing on his own. He gains nothing nor the people he tries to help get nothing by following the line of the Media and the Left to isolate our Social Solidarity efforts. It's too late. We can't hide behind our fingers any longer. 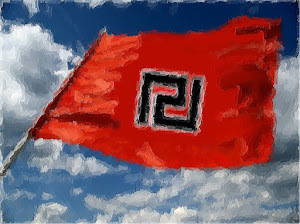 Every Greek that needs help or wants to help, should do so through the ranks of a highly organized and honorable Movement like the phenomenon that is Golden Dawn! Because, after all, it's US against THEM! A beautiful site. 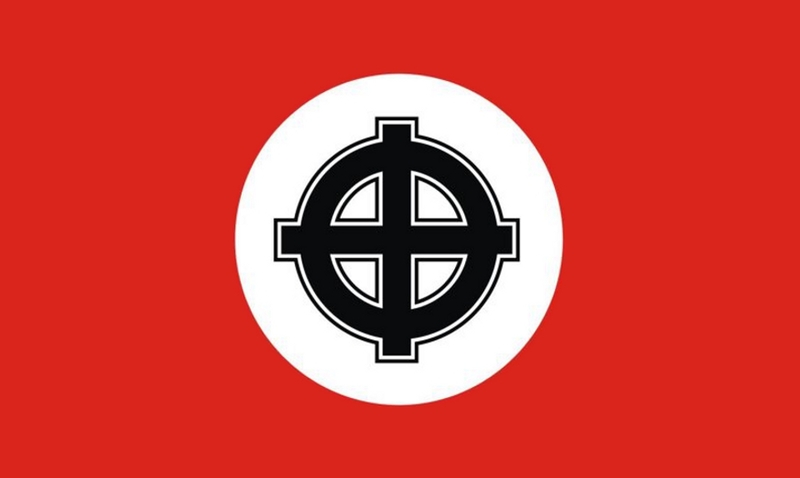 Helenic Europeans acting with true Aryan spirit. Solidarity is the key, and we need it in the UK, fast. Much respect from my former Britain, home of the ancient Druidic peoples. very nice, i really wish i lived in greece. here in america, i am fearing for my people. we need help bad. i dont feel safe at all.